Having said that, let me tell you another story. My wife’s cousin married a Palestinian man, named Issa. He and I have become pretty good friends. He’s pretty cool, but overall he’s had a tough time adjusting to life in America. Still, after three years or so, he’s catching on. He makes a traditional Palestinian dish, called Kofta bi Tahini. Kofta is a mixture of ground meat (usually beef, but sometimes lamb) and herbs and spices. It’s shaped into a sort of cigar shape, and then cooked in lots of different ways, like baking or grilling. But my favorite is when it’s baked with potatoes and a Tahini sauce. My wife thinks this is kind of an acquired taste, but, personally, I acquired it pretty fast. I could chug this stuff non-stop. It does have a pretty strong taste. If you aren’t used to foreign foods, and you want to try this, then you might use a little less parsley and a little less lemon juice. But, to me, that's what makes it great. 1 cup Tahini paste (sort of like peanut butter, except it’s made with sesame seeds instead of peanuts. You can get it at natural food stores and middle eastern markets. Mainstream supermarket staff will look at you funny when you ask them for it. Trust me…). Start with the meat. I usually use ground beef, because I have such a hard time finding lamb. I did find some when I made the Irish stew, but that’s another story. Put the meat, the parsley, the onion, the salt, the spices, and the oil in a bowl and stir it all up. When it’s all nicely blended, scoop some up in the palm of your hand and squeeze it into a finger or cigar shape, maybe about three inches long, and a little thicker than your finger. Set these aside. Slice potatoes into ¼” quarter slices. Then, scatter a cup of uncooked rice over the bottom of your dutch oven. Layer the potato slices on top of the rice. 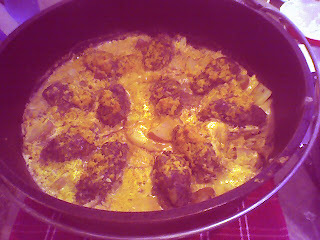 Place the Kofta shapes on top of the potatoes in a ring, with a couple in the middle. Mix tahini, lemon juice, and water It’ll take some stirring to dissolve the tahini and blend it all. Pour the mixture over the meat, potatoes and rice, covering all. Then put it on the coals. I baked it for about 45 minutes, turning the lid and the oven often, but not opening the lid everytime. Toward the end, check on the rice. Some of the grease from the meat will seep down and make the rice crispy, so you don’t want to overcook the rice. Mix the cucumbers, tomatoes, parsley, jalapeno, and onion in a bowl. Just before serving, add the salt, lemon and olive oil and stir. Last of all, spoon in the yogurt and stir it all up. I honestly don’t know which I like better, the Kofta or the salad. I could eat them both until I explode. But you be the judge. And, if you end up acquiring the taste, then you can join me for dinner someday!